Over the past two decades, Carolina García Jayaram has led national institutions and initiatives dedicated to enriching and shaping cultural and philanthropic communities around the United States. As President of CGJ Consulting, a firm dedicated to designing new models for civic engagement, she now provides strategic guidance to the public and private sectors. Most recently serving as CEO + President of the National YoungArts Foundation, Garcia Jayaram previously served as President + CEO of United States Artists (USA), which has awarded over $25M to this country’s most accomplished artists across ten disciplines and where she spearheaded a $20M operating endowment campaign. During her tenure as Executive Director of the Chicago Artists Coalition (CAC), she served on Mayor Rahm Emmanuel’s Cultural Advisory Council and was named Chicagoan of the Year in the Arts by the Chicago Tribune. Garcia Jayaram earned her Juris Doctorate from the University of Miami School of Law and has studied not-for-profit management at Harvard Business School. Garcia Jayaram’s philanthropic work includes serving on the Board of Directors for Guitars Over Guns; the Advisory Council for Ruth’s List Florida, which aims to elect progressive women to public office in Florida; on theAdvisory Committee for the University of Miami School of Law’s Art + Sports Law LLM program; and on the Latin American and LatinX Committee for the Perez Art Museum. Over the past two decades, Emilie Fritz Veloso spent her career as a consultant, entrepreneur and executive working to educate people around the world about health and wellness. Recently, Emilie accepted the opportunity to serve as CEO of The Sacred Space, a holistic lifestyle brand and home to Sacred Programming, Plant Miami, Flow – a curated wellness boutique, and Paradise Farm’s biodynamic harvest. Emilie was a co-founder and President of O.N.E. Coconut Water. She and her husband, Rodrigo Veloso, partnered together to build O.N.E. Coconut Water from a concept in their West Hollywood apartment to a globally distributed brand purchased by PepsiCo in 2012. Emilie earned her MBA from Pepperdine University and BA from Georgetown University. Emilie’s current philanthropic work is dedicated to Foster Care, the environment and helping elect women to public office. She is a Board Member of Genesis Hopeful Haven, a local foster care organization focused on keeping siblings together and assisting children who are aging out of foster care. Emilie resides in Miami, FL with her husband and two children, Arthur and Beatrice. Shannon Allen is the creator of grown and our resident mom-on-the-go. Shannon lives in Miami with her husband, Ray Allen (two-time NBA champion) and their five children. Grown's restaurant concept evolved from her television show, The Pre-Game Meal, inspired by 18 years of preparing optimal game day meals for her husband. The show featured professional athletes and chefs preparing healthier versions of tailgate food in hopes of inspiring soccer moms and sports fans alike to embrace a healthier diet & exercise. the fight against this potentially life threatening disease. Megan is the Co-founder of Get The People, a purpose-driven creative agency committed to supporting the creative needs of conscious lifestyle and fashion brands. Over the last decade she’s helped dozens of clients from emerging start-ups to global heavy-hitters transform and grow their brands. Most recently she launched the impact event series for Get The People, producing and moderating events for the global Fashion Revolution movement, spotlighting industry leaders and raising awareness about ethical and sustainable fashion. In addition, Megan is passionate advocate for ethical fashion, Co-founding Take Me Alive, a luxury streetwear line, ethically made in NYC. Most recently Megan was selected to lead the Miami Chapter of HEYMAMA, a global membership community for powerhouse mamas in business. 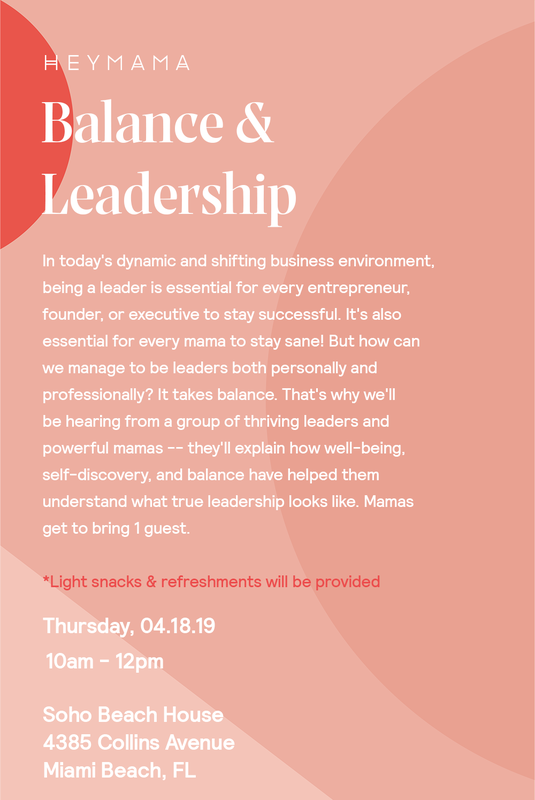 She helps build and support the community along with hosting engaging monthly events and gatherings from educational panels, dinner parties, mama and me retreats, to leadership luncheons, across Miami's most exclusives venues.